The great thing about Emm Gryner’s songs is the strength at their core. Her studio albums are richly arranged but the songs themselves not only hold up well under unadorned presentation, they thrive on it. Part of it’s because Gryner’s an accomplished musician and seasoned performer but a lot is due to her songs just being really good. Her set list featured several numbers from her new disc ‘Only Of Earth (Days Of Games)’ and an array of pieces from various places in her catalogue. A rendition of ’Space Oddity’ that used Bowie’s original lyrics marked her time in his band and the subsequent collaboration with Chris Hadfield was given a heartfelt reading that conveyed much of what she feels about those times. ’Summerlong’, a track from year 2000’s ‘Dead Relatives’, displayed the virtue of revisiting older pieces — that song became so fresh it seemed brand new. ‘Math Wiz’ (from ’Torrential’) absolutely sparkled. ‘Ciao Monday’ (from ‘Northern Gospel’) got the presentation befitting a signature piece; the roar of applause testified to that. Material from ‘Only Of Earth’ (Days Of Games)’ included (I believe) The ‘Prologue’, ’Shadow Girl’, ‘A Mission’ and a few others. The songs were delivered in a stripped-down form with keyboard accompaniment and use of a device to enhance her vocals with a slight echo at key moments. Beyond that, and the need for a PA to provide sound for the entire store, this was as close to an unplugged performance as can be had. The result was brilliant. Emm Gryner’s musicianship is all that’s needed to do justice to her songs. Her keyboard playing is marked by expressiveness, control and phenomenal bass lines. She literally creates a rhythm part that makes the music seem as if it’s coming from a place six feet above the ground. She’s also a strong rhythm guitarist. The numbers she played using just that instrument jumped almost as well the songs she performed from the keyboard did. Expressive shadings, articulate phrasing and the ability to project sent her numbers soaring through the venue. It was hot in the shop because the crowd was a large one. Sight-lines weren’t great either but none of that mattered. The chance to see an artist of Emm Gryner’s calibre in an intimate setting is what the artist and attendees make of it. 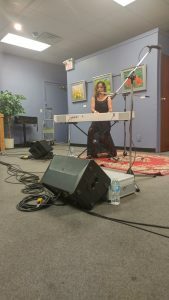 For her part, Gryner performed extraordinarily well, insured the sound was clear and engaged the crowd on a level that made the event a deeply personal one for any who chose to open themselves to it. That’s the mark of a consummate pro and of an person who cares passionately about what they do. She displayed that and everyone else got the chance to experience it.